NM Daniel Lowinger kicked off today’s event with a highly informative lecture on the topic of his new book the 3…Qd8 Scandinavian. After explaining the origins of how the Scandinavian became an integral part of his repertoire, Lowinger proceeded to give several highly detailed examples from his own as well as grandmaster games demonstrating the opening’s effectiveness. After the lecture the participants challenged him to a fourteen board 3…Qd8 Scandinavian themed simultaneous exhibition. 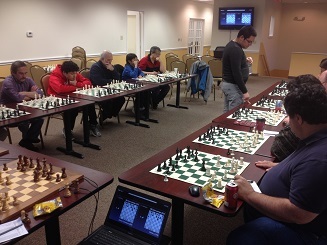 The average rating of the simul participants was over 1500 with an expert and two very tough class A players at the top of the table, making exhibition that much more impressive. Lowinger did however give up a loss to CCFC regular Sean McGuinness. 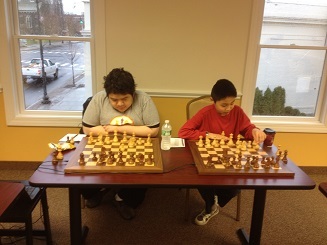 Zachary Tanenbaum, Dennis Li, Vladimir Kotov and Rich Tanenbaum all secured draws.